Costa Rica offers some of the world’s best whitewater rafting and kayaking rivers as the rivers plunge through spectacularly beautiful, largely unexplored tropical wilderness, so regardless whether you are an expert or beginner, nature lover or thrill seeker, rafting enthusiast or active kayaker, its always an unforgettable trip. I went on my first white water rafting trip down the Reventazon river during the Summer of 1992 and ever since then I have been hooked. Now by no means am I an expert at rafting the waters of Costa Rica and you put me on kayak or on a raft without a guide….well forget it. But I can give you some information and guide you on what I know about it and hopefully it will help you in deciding what river you would like to go rafting on. This calm, quiet section of Río Sarapiquí winds through tropical wet forest on the Caribbean side of the country and is perfect for nature lovers and birdwatchers. On a typical tour you will be picked up in the early morning from your hotel in San José, they will take you to a local restaurant for a delicious, typical Costa Rican breakfast call Gallo Pinto. On the way to the river, tehy will drive by the beautiful La Paz waterfall and rolling, verdant fields of coffee, papayas, sugar cane and ferns. Once you get to the Río Sarapiquí, you will get some lifejackets ( don’t worry) and paddles and give you a safety orientation for the river. You will begin rafting where the Class III trip finishes and continue down to Puerto Viejo. In some parts of the river you will pass green pastures and farmland, and may also see some people hanging out along the shore. The lower half of the river winds along the borders of the beautiful, protected La Selva Biological Reserve – thick with lush vegetation, towering trees, vines and flowers. About half way throught the will stop along the riverbank, where they will set up a great buffet picnic lunch prepared by your guides. Afterwards you’ll get back on the river (its cold back on the water !) and be able to take in the peace and quiet of the rainforest, also you will probably see some iguanas, turtles and a ton of different types of birds. A typical trip down this river will go something like this. Just like with rafting on the Sarapiqui, the rafting company will pick you up at your San José hotel, and take you to have some Gallo Pinto – a typical Costa Rican breakfast. Once you get to the river, you’ll raft 16 miles deep in the heart of densely vegetated gorges, past beautiful waterfalls, serene pools and pounding rapids. I think its one of Costa Rica’s most impressive primary rainforests. After having a fun afternoon running rapids like Upper and Lower Huacas, Cimarron, and many more, they will take you on a short drive to a “Operations Center”, so they call it and thats were they will give you lunch. You can also get changed here and also take a shower if you want. After your done eating, shopping and taking a look at the photos they took you of you, they’ll put you back on the bus to take you back to your hotel in San Jose. On the way, you’ll get some remarkable views of Braulio Carrillo National Park and Irazú Volcano. This is probably the most popular river in Costa Rica as it has some of the fastest and best 10 miles of Class III rapids you’ll ever paddle! If you’re first-time or experienced peddler looking for the excitement of big waves, hydraulics, and stunning scenery, then rafting trip down the Reventazon is for you! The drive from San Jose takes you through the impressive Braulio Carrillo National Park, past rainforest and waterfalls across the Continental Divide to the Caribbean side of the country. Once you arrive at the drop in spot , you will also have breakfast (gallo pinto anyone?) you’ll also be able to take that last bathroom break and if you haven’t done so already you get changed, put on that sun screen and any other last minute needs. As your raft rounds each new bend in this dam-controlled river, you’ll be greeted with yet another breathtaking view of the Reventazón Valley. While you are rafting (and doing your best not to fall out), try to look for toucans, kingfishers, herons, tanagers, iguanas and bright green “Jesus Christ” lizards. At the end of the rafting trip you’ll be at their “operations center” where they will set you up for lunch. And just like with the Pacuare you will have a chance to get changed, take a shower if you want, have a drink(or 2) and of course they have an area where you can pick up some souvenirs and look at the photos they took of you along the way. Once your done here, they will put you back on the bus and take you back to your hotel in San Jose. This river is for the more experienced people, especially if you go at the heart of rainy season of September and October. Its famous not only for its rapids but also because of its sheer beauty. A typical trip on this river will again start with having you picked up at your hotel in San Jose, and because of where you need to go, it will be a early, at 6am (almost hurts to write it) . They will take you to have breakfast (yep .. that’s right gallo pinto) and then you continue to the place where you will start the rafting trip. As with the other rivers, once you arrive at the drop in spot, they will give a chance to change and get yourself ready. This, being one of the toughest rivers has about 12 class IV rapids that you will go through. 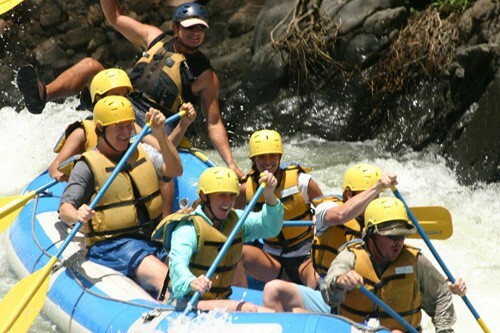 Although Pascua is definitely the most extreme of the all the rivers in Costa Rica, if your up for it, its a lot of fun. This trips ends like all the others where at the drop off point you will get a chance to change, take a shower and get something to eat. You will also get a chance to check out the photos they took of you rafting down the river. Then they will put you back on the bust and take you back to your hotel in San Jose. Class I – Easy – Waves small, passages clear; no serious obstacles, perfect for all ages and abilities. No guide needed. Class II – Medium – Rapids of low difficulty with passages clear. Suitable for everyone, no experience necessary. A guide is preferable for these rapids, but not required. Class III – Moderate – Waves numerous, high, irregular; rocks; eddies; rapids with passages clear though narrow, requiring experience in maneuvering. No previous experience is necessary. Class IV – Difficult – Long rapids; waves powerful, irregular; dangerous rocks; boiling eddies; powerful and precise maneuvering required. Have an experienced guide. Previous experience is helpful, but not necessary. 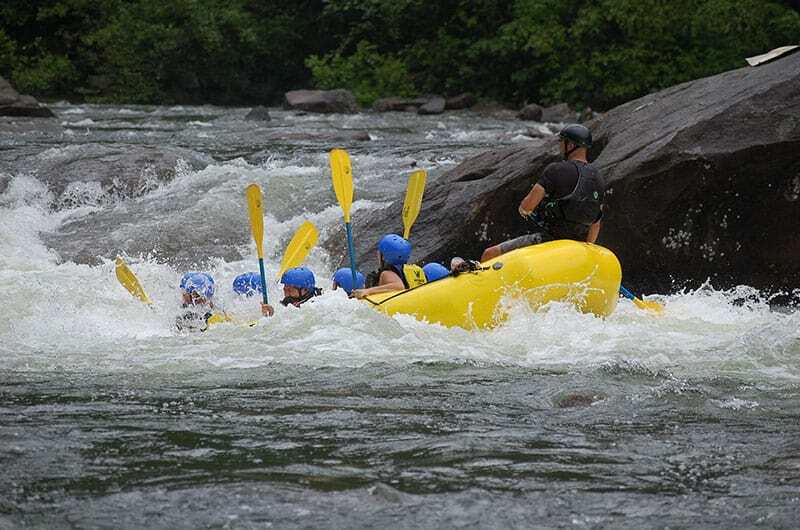 Class V – Extremely Difficult – Exceedingly difficult, long and violent rapids, following each other almost without interruption; riverbed extremely obstructed; big drops; violent currents; very steep gradient. Paddlers should have prior Class IV or better whitewater experience with experienced guides who know the river. All you really need is a swim suit and a teeshirt. You’ll be able to change your clothes after your done so no “quick dry” clothing is needed but couldn’t hurt and I would probably wear that if I already have both as you will get wet along the way wether you out of the raft or not. For shoes, I’d make sure to wear some watershoes or tevas. I prefer the ones that cover your toes so they don’t get smooshed on a rock but anything that can get wet and will STAY ON will work. Also some sun glasses and something like Croakies to keep them on. If you need some of this stuff I included links to Amazon so you can get what you need if you can’t find them locally. Also put on some sun screen before and you can take a waterproof camera but its difficult to take photos when rafting and the rafting company will have their own people taking pictures for you too buy later on. This is a bit spendy but alot less hassle and better photos of you and your group going through the rapids. The reason you only need just that is because depending on the rafting company you go with they either drive your items to your destination or they put your dry clothes in a “dry bag” which even if it fell overboard would keep all the items in it dry. Now you should put a towel and some change of clothes so when you get done you have something dry to change into. Be sure to have some cash on hand to tip your rafting guide. If you are going at the right time of year i.e. the rain season of June – November its one of the best activities you can do in Costa Rica. If you have solid Class IV experience and you want to have an adrenaline junkie trip and avoid families, go for the Pasqua/Reventazon or San Miguel/Sarapiqui trip. Otherwise do the Pacuare for a beautiful trip with some great rapids. If you are going in say January of February, I probably would not go as the water levels will be low and its a lot less fun. One last point I would like to make is that, as you have probably noticed, a rafting tour usually starts and ends in San Jose, so you will need to spend 2 nights in San Jose if you want to go rafting and therefore its going to burn 2 days of your vacation, so keep that in mind. You may be able to make other arrangements with the rafting company such as meeting them at the drop off point, if you rented a car, but that’s really on a case by case basis.